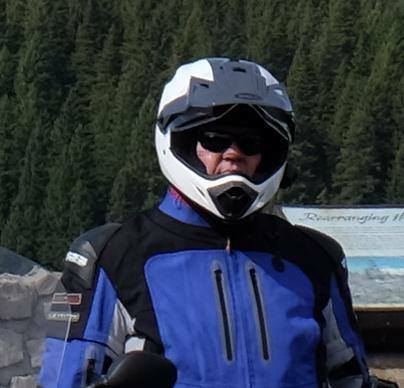 Yesterday I rode 300+ miles in my new Bell MX-9 Adventure helmet. For you guys who know me, I love my red Bell Star Rally helmet. It’s light, quiet and comfortable. Off-road it didn’t flow enough air though and the auto-darkening shied (which I love) got too dark to see when riding through deep shadows on forested fire roads. I needed something that would flow more air (especially in the summer months), be quiet enough that I could still ride on the freeway to get to the fun stuff and be light enough that I could forget it was there. To my surprise, the MX-9 does all of that. I used a digital scale and it came out just a hair lighter than my Star. I mounted my old Sena 5 and it works just fine. Out on the road, it’s actually quieter than the Star. I think that’s because the Star has noisy vents. (The star gets quieter when vents are closed.) The MX-9 exceeded all my expectations and will be my warm weather helmet with no regrets. I’m also thinking this will take some heavy-duty wear and tear off of my Star and help it last longer. * No buffeting (even at 65+ with the visor on). I do have a tall windscreen though. * Sizing is the same as my Star. I wear an XL and it fit perfectly. * I’m use to the super easy shield removal levers on the Bell Star. The MX-9 shield is simple to remove by unscrewing a small screw from each side but as soon as you do that, the small, black ratchet cams fall out and try to escape. Better be careful. I’ll order a set of extras before any big trips. * The D-Ring strap works fine but why not use the super easy magnet retainer like all the other newer Bell helmets? The MX-9 has a snap retainer. * There is only one truly usable ratchet shield position. Go up one notch and you have a 1/2″ opening at the bottom of the visor. Go up another notch and the curved, bottom edge of the shield is directly in your line of site. Go up another notch and the shield is almost all the way open and out of your line of site. Go up the last notch and it’s way up there, see description at position 3. This is a bummer compared to the Star that has more positions and my favorite option, a tiny lever that cracks the shield open just a little bit, perfect for letting in a little air. That’s it. I was afraid I wouldn’t like it as much as I like my Star but I’m totally happy with it. It’s both DOT and ECE certified.